With an annual production capacity of 2.4 million tonnes of high quality molten aluminium, UAE-based Emirates Global Aluminium (EGA) ranks among the top five largest primary aluminium producers in the world. With its entire production pre-sold each year, EGA’s two core operating subsidiaries – Dubai Aluminium (Dubal, also known as EGA Jebel Ali) and Emirates Aluminium (Emal, also known as EGA Al Taweelah) – consistently operate at full capacity. Given that it typically takes 13 to 15 megawatt hours (MWh) to produce one tonne of aluminium, maintaining this operating level demands a substantial amount of electrical energy. The demand is satisfied internally by the captive power stations integral to both smelter complexes. The combined power generation capacity of Dubal and Emal is 5,450 megawatts (MW), which represents approximately 20.2 per cent of the 27 gigawatts (GW) of installed capacity in the UAE. This makes EGA an important player in the UAE energy sector. Cognisance of the responsibility is evident in the sustainability principles applied at both sites. 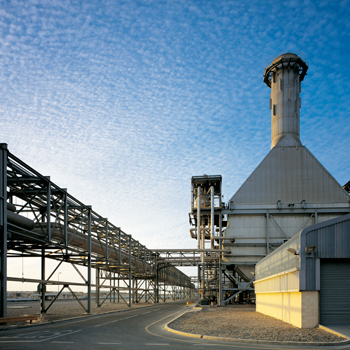 For starters, the Dubal and Emal power plants are configured in cogeneration and combined cycle. Chemical energy from fuel is converted into heat energy through combustion. The heat energy then passes through gas turbines where it is converted into mechanical energy, which is then converted to electrical energy using generators. The resulting alternating current (AC) is converted into direct current (DC) by rectifier transformers, for use in the aluminium reduction process. The gas turbines contain heat recovery steam generators (HRSGs) which produce steam, thus providing fuel-free energy to generate power from steam turbines. The Dubal power plant has 23 gas turbines and seven steam turbines, supplying on-site power for Dubal as well as externally to nearby customers. Approximately 27 per cent of the power generated at Dubal is fuel-free. In addition, waste heat from the Dubal power plant is used to produce potable water through a sea water desalination plant. 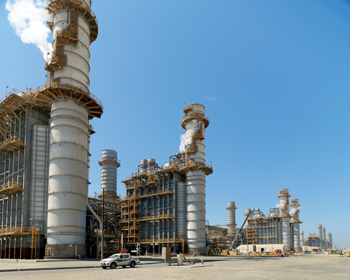 The Emal power plant has nine gas turbines (eight fitted with HRSGs) and four steam turbines, supplying on-site power for the operations – including a reverse osmosis sea water desalination plant. Some 34.8 per cent of the power generated at Emal is fuel-free. Although the Dubal and Emal power plants make both operations effectively self-sufficient in terms of energy requirements, a broader sustainability agenda at EGA is translated into ongoing efforts to minimise the power consumption of their respective operations. Through on-going optimisation efforts, the thermal efficiency of the Dubal power plant has improved over the years and in 2014, it reached its highest-ever level of 46 per cent. Greater thermal efficiency means increased power generation to produce hot metal, while the fuel requirement increment is proportionately less – with direct environmental benefits in terms of fossil fuel combustion and associated environmental emissions. The thermal efficiency of the Emal power plant, a much newer utility, was 47.85 per cent in 2013. After completion of the Emal Phase II expansion, the net efficiency has been recorded at 51.62 per cent. Further demonstrating EGA’s commitment to energy optimisation, the business has developed and implemented some of the most advanced reduction cell technologies available in the world. Indeed, EGA’s proprietary DX and DX+ Technologies, both of which have been deployed at industrial scale at Emal, operate at higher amperage levels. This not only yields higher productivity but also translates into lower specific energy consumption (below the industry norm) and associated reductions in both fossil fuel combustion and environmental emissions. EGA’s commitment to protecting the environment is also evidenced by the Dubal and Emal power plants operating primarily on natural gas (the ‘cleanest’ type of fuel), which contributes to reduced air emissions (distillate is used only in the event of shortages or emergencies). The company also deploys the best available technologies to further reduce air emissions during the power production process. For instance, EGA’s gas turbines are fitted with dry, low nitrogen oxide (NOx) burners, which allow the gas to be burnt at a lower temperature, resulting in lower NOx emissions. At Emal, essential upgrades on the Phase I gas turbines during 2014 included a combustion system upgrade from the existing Dry Low NOx (DLN) 2.0 technology to the most advanced DLN2.6+ reduced combustion system on the four combined cycle gas turbine units, and installation of Cooling Optimisation and Compressor Upgrades Packages for all six Phase I gas turbines. This effectively reduced the Emal power station’s NOx emissions by 1,200 tonnes per annum and carbon dioxide (CO2) emissions by 917.725 tonnes per annum. Several energy-savings projects have been implemented across the two plants. At Dubal, for example, lighting is continuously audited with the aim of identifying and implementing energy-saving solutions; energy-saving bulbs have been fitted – resulting in a power consumption reduction of 12,510 kWh per year; and a plant-wide conversion to light emitting diode (LED) lighting is on the cards. Other energy-saving practices include motion sensors and photo cells being installed in many areas – particularly in unmanned substations; and air conditioning thermostats being set at 24°C during working hours and 27°C during non-working hours to minimise the air-conditioning load. In 2013, the absorption chiller installed at Dubal became the UAE’s first-ever absorption chiller set-up in a power plant that uses excess heat to produce chilled water for comfort cooling. 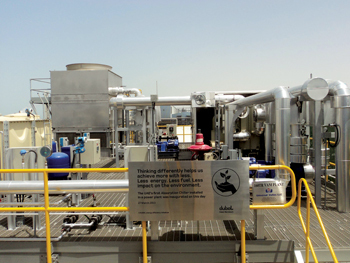 Installed on the rooftop of the Dubal desalination plant control building, the absorption chiller has replaced the electrically-driven vapour compression chillers used previously and consumes less than 1 tonne/hour of steam. The absorption chiller has proven to reduce the company’s energy consumption by approximately 780,000 kWh per year, and also reduced the company’s carbon footprint. This has attracted the interest of the Dubai Municipality, which is exploring ways of using this technology more broadly. Moreover, although the location of Dubal and Emal in the Middle East ensures an abundant source of energy, primarily from natural oil and gas, EGA strongly supports national and regional efforts to find and adopt alternative energy sources. Particular support is given to the integrated energy strategies implemented by the UAE which address (among other aspects) demand abatement, diversifying the nation’s energy mix and the adoption of renewable energy sources – which will collectively ensure a higher level of energy security. In terms of renewable energy, EGA’s efforts to date have included Dubal’s investment of Dh20 million ($5.45 million) in Mohammed bin Rashid Al Maktoum Solar Park (Dubai) Phase I (13 MW); participating in a feasibility study relating to the establishment of clean coal-fired power stations in the UAE; and building a mini solar field at Dubal (70 kW). Under the sponsorship of the Executive Affairs Authority in Abu Dhabi, Emal is working closely with Abu Dhabi Transmission and Despatch Company (Transco) and Abu Dhabi Water and Electricity Authority (Adwea) to optimise gas utilisation within the Emirates. Several initiatives that will contribute towards establishing a more efficient grid are at various stages of implementation.